Upstands are fitted at the back of the worktop along the wall to form a neat border and can be any height from 50mm up to 100mm or more. 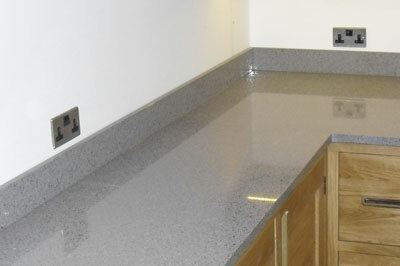 They help contain liquids spills and aesthetically finish the worktops with a crisp clean line. If you are thinking of replacing your laminate or wood worktops and want to keep the existing wall tiles, upstands are also essential. They cover the 10mm gap left by the old worktops, which are usually 40mm in depth. Granite and quartz worktops are available in 30mm, 20mm and 13mm thicknesses with 30mm being the standard, although 20mm is gaining in popularity.